Loriete these are really lovely!! 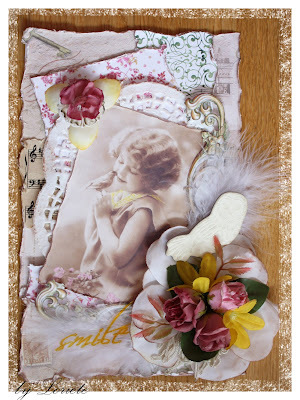 Such beautiful flowers and pictures. Are you like me because I never make cards and I never finish them!! In fact I would rather buy a card than make one.......recently though I have gained a new respect for cardmakers when I see some of the talent and hard work that they put into making them! 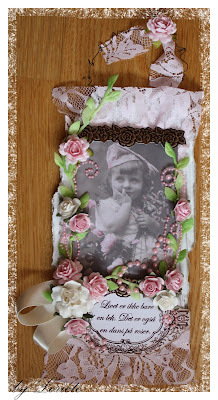 I cheated a bit on this months new challenge.....I had already started a card so I added some Vintage roses onto it!! for noen nydelige kort, mestrer godt å lage kort og du ja. Oi... Kaip sudominai. Man kilo begale klausimu ir labai noresiu gyvai isciupinet. Antrojoje: is ko padaryti tie kringeliai? is ko ar kaip padarei pavadinima "smile"? Pirmoje ydomu paziuret kaip pritvirtinai tuos merinius? Ir dziaugiuosi matydama, kaip rozytes naudojamos :) LABAI GRAZU!